Russia on the move in the Middle East: Has World War III begun? (NationalSecurity.news) The United States and Russia agreed to urgent talks in order to find ways to avoid conflict in Syria a day after Moscow’s warplanes launched their first attack against what American intelligence officials say were concentrations of anti-regime rebels. On Thursday, the UK’s Daily Mail reported that Russian officials said warplanes had launched strikes against 12 targets belonging to the Islamic State of Iraq and Syria, or ISIS, including one command center in Hama and ammunition depots in Idlib on the second day of bombing sorties. However, a Syrian security source told reporters that Russian planes had also attacked a powerful coalition of Islamist rebels which included al Qaeda’s Syrian affiliate, a group fiercely opposed to ISIS. “Air strikes from four Russian warplanes struck bases held by the Army of Conquest in Jisr al-Shughur and Jabal al-Zawiya in Idlib province,” a Syrian source told Agence France-Presse, adding that depots held by “armed groups” in neighboring Hama province were also hit. An Army of Conquest member said on Twitter that “Russian pigs” had also destroyed a mosque in Jisr al-Shughur. The group controls the Idlib province and has made recent advances towards Syrian President Bashar al-Assad’s coastal heartland of Latakia. In addition, a car bomb factory north of Homs was also destroyed, it said. The Syrian Observatory for Human Rights, based in Britain, said in a statement that airstrikes in the central province of Hama struck locations occupied by U.S.-backed rebel group Tajamu Alezzah. 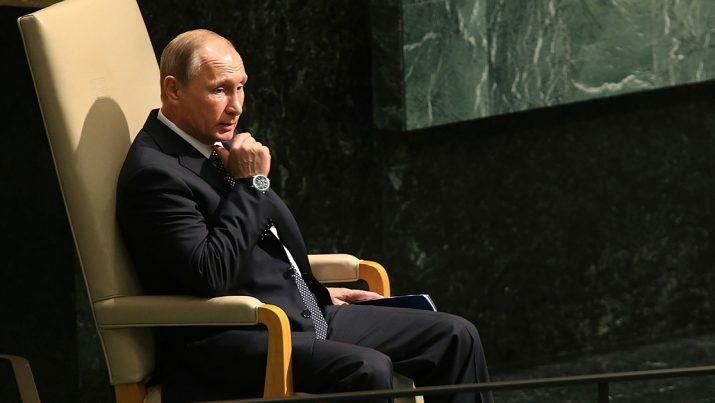 A spokesman for Russian President Vladimir Putin had earlier announced that Russian airstrikes targeted positions held by ISIS and other extremist groups. The Daily Mail also reported that Ramzan Kadyrov, the strongman leader of Chechnya, stated Thursday that Moscow should expand its operations in Syria – which began a day earlier with controversial airstrikes on anti-government rebels in defiance of the West. “I’m convinced that not only airborne should be used there, but also infantry, because the faster we finish off ISIS, the more peacefully we’ll live across the territory of global community,” he said. The Russian strikes prove, once again, the weakness and disarray of the Obama Administration in dealing effectively with Moscow, as well as devising a workable strategy in Syria. As NationalSecurity.news has reported, the administration – whose policy is the removal of Assad, which is completely at odds with Moscow’s policy of supporting the Syrian leader – thus far has been unable to muster a coherent fighting force to oppose government forces, let alone convince Putin to stay out of the conflict. Military analysts have suggested that the Russian leader – who is forging an alliance with the Iraqi and Iranian governments – senses that Obama has no interest in seriously committing U.S. military force to the effort in Syria. As such, Putin senses both a power vacuum that he wants Russia to fill and an opportunity to become the dominant force in a region rich in natural resources and potential customers of Russian military hardware (Iran recently signed a $21 billion deal to purchase Russian satellite equipment and aircraft). And while some U.S. officials have quipped that Russia has erred by stepping into the Syrian “quagmire,” others believe that the close proximity of U.S. and Russian forces, as well as the pursuit of competing foreign policy objectives, makes conditions ripe for miscalculation and open conflict between two major nuclear-armed powers. “If his first military campaign, his first military action in Syria is to bomb non-ISIL organizations that are against Assad, that sends a pretty sharp message to us that we don’t have the same objectives in Syria,” Michael McFaul, who stepped down as U.S. ambassador to Russia in 2014, told POLITICO. Defense Secretary Ash Carter, who described Russian action in Syria as “pouring gasoline on a fire,” also said the potential for conflict between competing forces was serious. Frustration with the administration’s lack of coherent and effective policy in the Middle East in general is frustrating Congress. “Too often we have confused our friends, encouraged our enemies, mistaken an excess of caution for prudence, and replaced the risks of action with the perils of inaction,” said Sen. John McCain, R-Ariz., the administration’s harshest foreign policy critic, in an opening statement to a U.S. foreign policy hearing in September. Bypass the mainstream media – visit AlternativeNews.com for the latest information you can trust!